Ask IndefinitelyWild: What's The Best Add-On Camping Insulation? You’re out camping when suddenly it’s colder and wetter than expected. What’s the best add-on or emergency insulation you can bring that doesn’t take up too much space or weight in your pack? 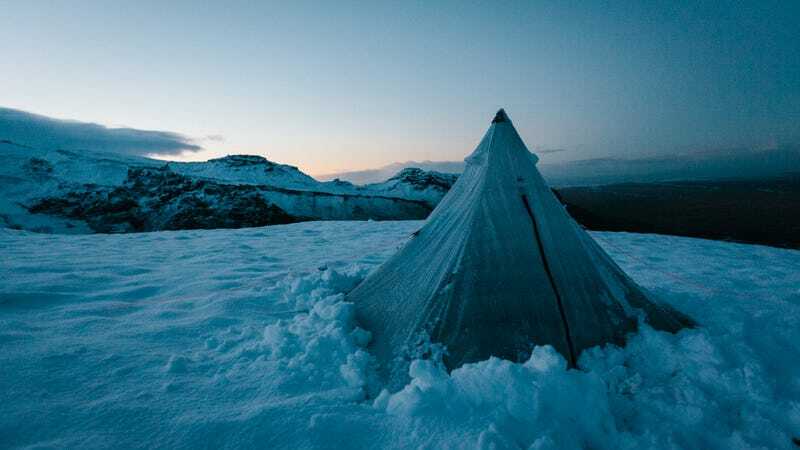 Space blanket, emergency bivvy, silk sleeping bag liner...tell us your experiences. Welcome to the first in an irregular series — Ask IndefinitelyWild. You guys are out doing stuff as much as we are, so I figure there’s a massive base of knowledge here we should be taking advantage of and sharing. Plus, I’m incredibly proud of the quality of our community, so I figure it’s time we give back a little bit. We’ll be giving away an item of outdoor gear from our closet with each of these. For this first installment, I’ll pick whatever I feel is the most useful or insightful comment and ship that reader that Biolite Nanogrid battery/lantern/flashlight thingie. Corey, one of our contributors, is taking his wife backpacking and fly fishing in the High Sierra this weekend. Last week’s snow is still hanging around, so it’s going to be a little colder and wetter than anticipated. They have good, warm equipment, but I was up there last weekend and it was freezing, largely because it’s so wet. To ensure their comfort, we think it’d be a good idea to take along a little extra nighttime warmth. But how do you do that in a format which isn’t too heavy or too bulky? They’ll already be carrying an extra gear for reviews and photos, so their packs are already heavy. I’ve had a lot of luck with the Coleman Fleece Sleeping Bag Liner, it’s cheap, machine washable and when it’s inside a sleeping bag, very warm. But it’s also big and heavy. A SOL Emergency Bivvy helped me get a little sleep once when temperatures plummeted to 0 degrees unexpectedly, but it was awfully noisy and not really made well enough to use multiple times. Corey’s thinking about ordering a Sea to Summit bag liner. What products do you have experience with and what would you recommend using? Let’s stop short of filling their sleeping bags with leaves. Standard Gawker contest rules apply. Anyone can comment, but I’m only shipping within the US. A winner will be chosen on Friday and announced here.